The winter climate requires paving materials that can withstand the extreme effects of coldness that can cause freezing and thawing effects. The best paving material for roads in the winter, include slate, porcelain, travertine, paving brick, asphalt, stamped concrete, and Terra Cotta. Slate has a high weatherproofing capability over other stones like marble or granite, which are very porous. As a result, slate resists the effects of thawing and freezing that happens during the winter, but it requires proper installation. Slates are also durable. During the installation, one can split the slates into sheets of the desired sizes for use in the intended paving needs. Their ability to withstand thawing and freezing effects of the cold climates makes them suitable for use in the winter. Porcelain is an extremely strong material over the regular ceramic because of its preparation in extremely high temperatures. Porcelain has a good waterproofing capability and comes in different colors that do not fade easily once used in the pavements. The availability of the textured surfaces eliminates the risk of having a slippery surface during the winter and falls. Porcelain is a suitable paving material for use in the winter because of its high strength, waterproofing capability, and slip resistance. The travertine material used to be unpopular for use in road paving during the winter climates because they are porous. However, the sealing technology on the travertine eliminates their porosity. The sealing on the surface enables them to bear up during the winter climates, making them suitable for use in paving the landscapes and roads without the fear of the winter climates. The best technique with travertine involves dry laying the materials and applying stone dust between the joints rather than polymer sand. Removing any cracked travertine materials on the pavement is easy. The travertine serves as a useful road paving materials during the winter climate because sealing them prevents porosity and one can easily replace the cracked materials from the pavements. Paving bricks can resist cold weathers and traffic. Some of the bricks can interlock, hence installed without using the cement mixer. These bricks come in different colors, but these colors fade gradually. Making the bricks well increases their durability and serviceability. When one fires the clay bricks for a long time in extreme kiln temperatures, they become very string with higher resistance to the effects of the winter climate. Paving bricks are durable and resistant to the effects of the winter climate. Asphalt is a common paving material on the roads. The material works well in extreme temperatures because of its ability to resists contraction and cracking effects that arise during the winter climate. 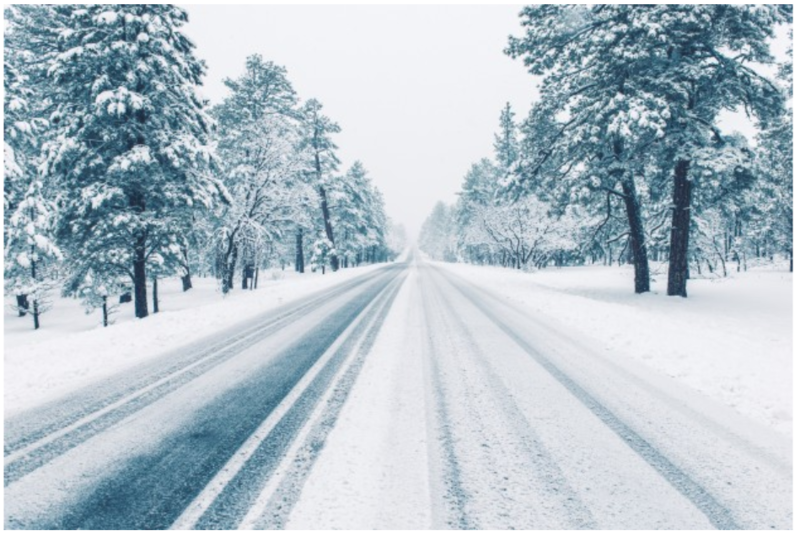 Asphalt prevents the breakage of the pavements during the winter season by enabling the roadways to flex and breath, helping in the prevention of breakage/cracking. Therefore, it is suitable to use asphalt during the winter climates to pave the roads because it will withstand the pressure that can make it crack. Stamped concrete has higher resistance to frost heaving while compared to the brick concrete. People prefer the material because its installation on the pavements takes little time than most of the other materials. The contractor, wearing gloves to protect his skin from rashes caused by the chemicals in concrete, pours the concrete on the road, trowels, and stamps it before setting. The concrete stamping aims at giving it a look similar to that of cobblestone or brick. Dying the surface will help to provide the material with any desired colors. Therefore, the ability to resists frost heaving is the reason that stamped concrete works well as a paving material in the winter climate. Terra Cotta is similar to the porcelain but baked under low temperatures. Terra Cotta has low-porosity resistance, hence require sealing while used to pave roads in the winter season. However, they have unpopular because one has to seal the materials every two years, but are suitable for paving in the winter climate only when sealed to resist porosity.